Mohd Ramdan Rosli and Mohd Adli Salihin had a positive start to the inaugural PETRONAS AAM Malaysian Cub Prix Championship at Jempol as both riders qualified for the SuperPole on Sunday having made the top five cut in the timed practice sessions. 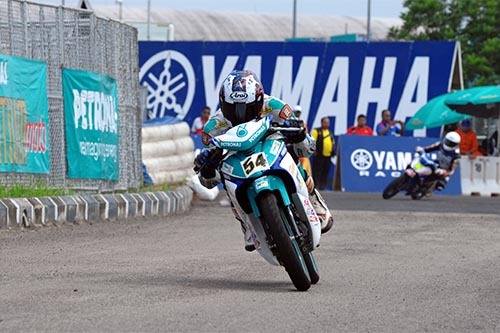 Ramdan of PETRONAS Syntium Moto Yamaha AHM clocked in the fourth fastest time in the CP130 category with 49.556s while Adli registered fifth with 49.722s. Leading the time sheets was Mohd Zaqhwan Zaidi with 49.396s while Temerloh winner, Norizman Ismail and teammate, Elly Idzlianizar Ilias completed the top three with 49.408s and 49.450s respectively. Besides from Ramdan and Adli, other Yamaha backed riders who made the SuperPole cut was Yamaha Maju Motor Racing’s Abdul Muhaimin Roslan, replacement rider, Mohd Taufiq Roslan (PETRONAS Yamaha-CKJ) and rookie, Mohd Adib Rosley (Motul Yamaha YY Pang). The three riders registered seventh, ninth and 10th fastest. Meanwhile, Fakhrusy Syakirin Rostam lead the CP115 time sheets with Motul Yamaha YY Pang’s Mohd Izzat Zaidi Salehan and PETRONAS Yamaha-CKJ’s Ahmad Afif Amran in tow. Fakhrusy topped the practice session with 50.421s but to hold the fastest lap record on the 945 meter track was Afif who timed 50.382s in the morning practice. However, the Terengganu born rider was unable to improve his lap time in the evening practice and had to settle for third fastest with 50.712s while Izzat sits in second position with 50.593s. 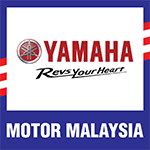 Besides Izzat and Afif, other Yamaha backed riders who will go through the Shoot-Out on Sunday include Tengku Amirul Haffirudin, Abdul Haffiz Rashid, Amirul Hakim Mohd Rizal and Mohd Hafiz Nor Azman. Warner Pumps-YSP’s Mohd Shafiq Rasol and Mohd Hafiza Rofa enjoyed a good start in Jempol as the duo appeared fastest from their respective groups in the WIRA opening practice. Shafiq led the way with 51.372s followed closely by Hafiza who was second quickest with 51.881s followed by Hyperspeed YAM Honda Racing’s Khairul Idham Pawi third, 51.898s. Completing the top five was Mohd Rabilfirli Nooral Azmin of Faito Factory Racing and Khairul Idham’s teammate, Mohd Syafiq Rosli with 52.410s and 52.458s respectively. Though the Timed Practice session for the Yamaha 135 Super Series sees Mohd Khairul Ikhwan Ajis plow through the rest of the pack to lead as fastest, the ending then turned as expected when Mohd Azam Omar recorded his time to be the fastest. Running for the eighth leg of the PETRONAS AAM Malaysian Cub Prix Championship, Azam was earlier held off by Khairul Ikhwan as the rider was looking for a way to get the ball rolling after a big letdown in Temerloh. Azam however held strong and came through with 4 minute left in the session. He did his fastest time in 52.656s while coming in second was Mohd Helmi Azman in 53.041s. Despite his efforts, Khairul Ikhwan only managed third fastest in 53.395s. Though the fight is yet over with the final race on Sunday in plain view, Azam Omar will definitely make things right again after a dismal run in the last round where he came in eighth in the race in Temerloh. Completing the top five fastest for this session was Kasma Daniel Kasmayudin in fourth and Mohd Ibrahim Mohd Norrodin fifth. Kasma did 53.413s while Ibrahim recorded 53.442s.